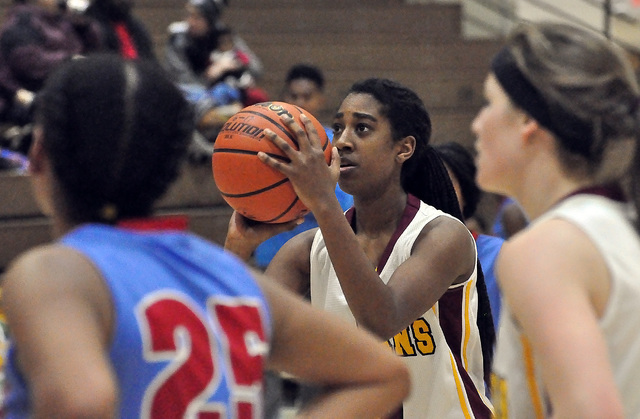 The Lady Trojans basketball team lost a heartbreaker on Tuesday night to Western, 29-28, at home in a battle for third place. Horace Langford Jr. / Pahrump Valley Times Alyvia Briscoe goes for the jumper against Western on Tuesday night. Briscoe set up the Trojans for a chance to steal the game away from the Warriors by hitting two 3-pointers at the end of the fourth quarter. Her last one was with 26 seconds to go in the game. Horace Langford Jr. / Pahrump Valley Times C'mone Wray-Ball seen here concentrating on a free throw. She played a crucial role in getting the Trojans within in striking distance by sinking 5 free throws out of six against Western in the third and fourth quarters on Tuesday night. 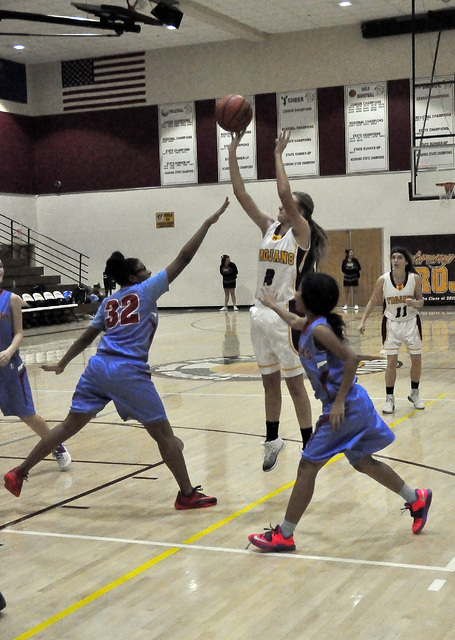 With just 26 seconds to go, the girls were down by two and junior Alyvia Briscoe sank a 3-pointer to put Pahrump (8-11 overall, 2-3 Sunset League) ahead by one, 28-27. With just 10 seconds left, the Warriors (9-8, 3-2) were not out. Western’s Millani Johnson hit for two, which gave them the lead with three seconds left. The Trojans tried to take the ball down the court, but just didn’t have enough time to get a shot off. Pahrump had dug themselves a 19-7 hole by halftime. The first half was so bad that the girls only scored two points in the first quarter. The second half was a different story. According to Hopkins, this was the best half of ball the girls played all year long. The girls came out in the third quarter and just played their game. The Trojans defense blanked the Warriors in the third quarter, outscoring them 7-0. A key factor to the scoring of the second half was the free-throw shooting of C’mone Wray-Ball, who came off the bench and shot five out of six free throws. “She knows what is expected of her coming off the bench and I told her she could play the whole second half because of her passing abilities,” the coach said. Another offensive key was Briscoe hitting two 3-pointers in the fourth quarter and one layup. He also said the girls had some minor injuries and key players getting sick lately. The Trojans fall to fourth place and are still in contention for the playoffs, which take the top four in each league. The girls start the second half of the season on Thursday, which was past deadline. Western, like Pahrump had a coaching change and it showed. Western girls are far more aggressive this year. The new Warriors coach is Phillip Payne, a wide receiver for UNLV from 2008 to 2011, and a graduate of Western. “I always wanted to come back, but I never thought it would be in this aspect,” Payne said. Payne even made it to the NFL signing in 2012 as an undrafted free agent and he spent some time in the Arena Football League. He enrolled in the Clark County School District’s Alternative Routes to Licensure (ARL) Program and last year became an assistant for Western’s JV boys basketball team and then took over the girls program this year. He is thinking about someday coaching for the struggling Western football program but for now, he is concentrating on turning around the girls basketball program. Tonight the Trojans host Boulder City (7-11, 3-2), a team they barely beat, 27-26, on Dec. 14. The game is at 5 p.m.